I got the "18 Piece Mini Nail Polish Gift Set" of Quo by Orly nail polishes for Christmas. As by the name, you can tell that these are 18 mini nail polishes of varying shades and finishes. From what I can tell so far, most look shimmery or glitter, but there are a few which have a flat finish. A lot of the nail polishes in this set look duochrome to me in the bottle, but after trying this nail polish, I'm second guessing whether they actually end up being duochrome on the nail. This one potentially disappoints (because I haven't been able to test it in the sunlight - it's dark out now!) 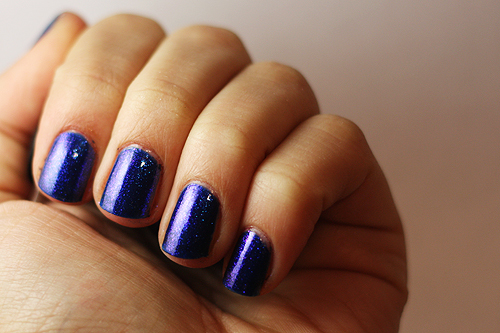 but to me, it looks just like a royal blue glitter. With that said, it is a beautiful shade regardless of the absence of duo chrome-ness. Another disappointing fact, however is that it took 4 coats to get to this shade. 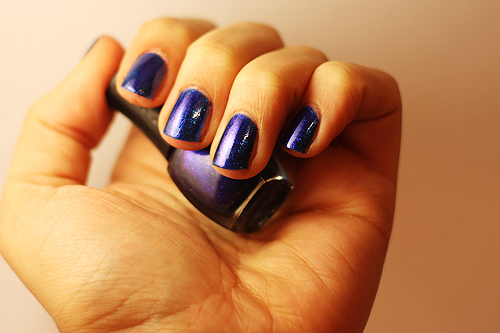 I would hope for a bit more opaqueness for this nail polish. Onto swatches! This second picture captures the duo chrome aspect of Celestial Star a bit better than the first. 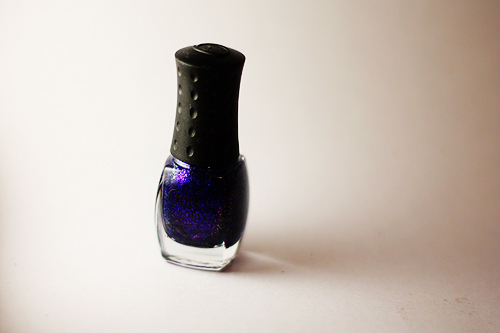 In the bottle it looks like a royal blue shimmer with a bright purple duo chrome. You can see a little bit of the purple in this picture, but not as much as I was hoping after seeing the bottle.